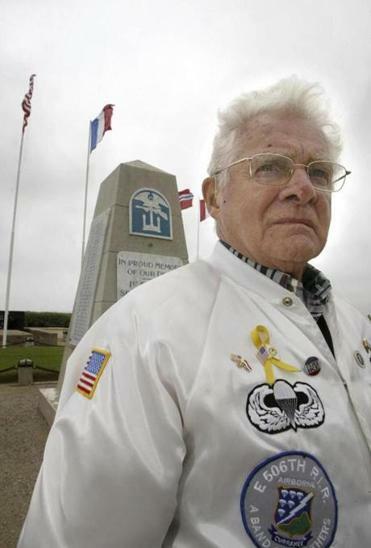 SALEM, Ore. — Donald Malarkey, a World War II paratrooper who was awarded the Bronze Star after parachuting behind enemy lines at Normandy to destroy German artillery on D-Day, has died. He was 96. Mr. Malarkey was one of several members of ‘‘Easy Company’’ to be widely portrayed in the HBO miniseries, ‘‘Band of Brothers.’’ He died Sept. 30 in Salem of age-related causes, his son-in-law John Hill said Sunday. Mr. Malarkey fought across France, the Netherlands, and Belgium and with Easy Company fought off Nazi advances while surrounded at Bastogne during the Battle of the Bulge in December 1944. He was often praised for his actions during the war, and was presented with the Legion of Honor Medal — the highest honor awarded by the French government — in 2009. Mr. Malarkey was haunted by memories of combat and the devastation of losing fellow soldiers and friends, his family members said. Still, the release of the ‘‘Band of Brothers’’ miniseries was cathartic for him and helped him come to terms with the emotional scars of the battle, Hill said. Donald Malarkey was born on July 30, 1921 in Astoria. He was a freshman at the University of Oregon when he was drafted into the Army in 1942 and volunteered to become a paratrooper. He returned to the University of Oregon after the war, receiving a bachelor’s degree in business in 1948. While a student at the school, he met and fell in love with Irene Moore. The two married in 1948 and had four children — Michael Malarkey, Marianne McNally, Sharon Hill, and Martha Serean. Mr. Malarkey met with historian Stephen Ambrose in 1987, and in 1989 traveled with other members of Easy Company to Europe to provide oral histories of their war experiences. Those recollections became the basis for “Band of Brothers” and an earlier book with the same name written by Ambrose. Mr. Malarkey also detailed his experiences in a 2008 autobiography written with Bob Welch, ‘‘Easy Company Soldier.’’ He was frequently asked to speak about his experiences in WWII, and he lectured at West Point and made trips to Kuwait and Germany to meet with wounded soldiers from the Iraq War. He remained close to the other surviving members of Easy Company and attended his final Easy Company reunion in Portland in August. ‘‘You could look back and with great pride realize that you had done a very significant thing and acted responsibly in what amounted to saving the world,’’ Mr. Malarkey told Oregon Public Broadcasting in 2012. He leaves his daughters and his sister, Molly Rumpunkis.